A wire wrapped joint is a very decorative method of joining metal. 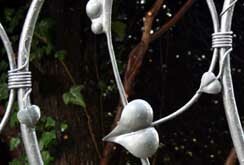 The steel wire is heated with an oxy-acetylene torch to soften it then carefully entwined around the work being joined. Often the wrapping will be used to hide a much stronger (but far less attractive) arc weld behind it, though it can be used on it's own for less structural work. A collared joint can be used instead if a stronger mechanical, non welded joint is required.